Whether it is Jonny Wilkinson for England or Brian O'Driscoll for Ireland, every team has at least one key player they cannot afford to pick up a serious injury. The three injuries all rugby players want to avoid, especially during the World Cup, are ruptured cruciate ligaments, a torn hamstring and a dislocated shoulder. 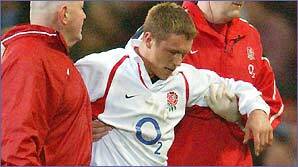 Knee ligament injuries used to be career threatening 20 years ago but are routinely managed these days. Hamstring tears and shoulder dislocations take less time to heal but can flare up again if recovery is rushed. Tana Umaga's All Black magic!